After spending three weeks in jail because he couldn't afford his court debt, Papa lost his job at a small steel plant. He has since found a job as a security guard. Papa is still making payments of $40 a month to pay off what remains of his $2,600 in court costs. 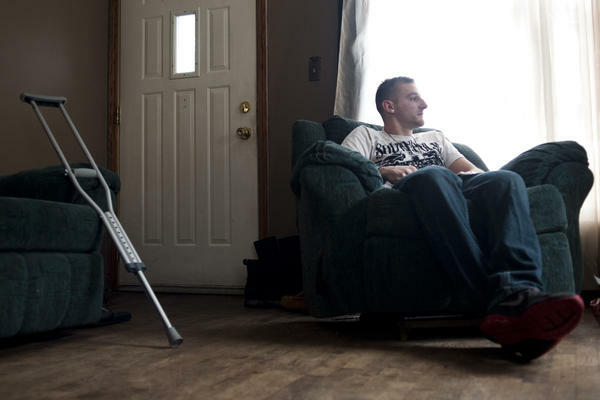 Stephen Papa, who was homeless and without a job after returning home from the Iraq War, has been living with friends. 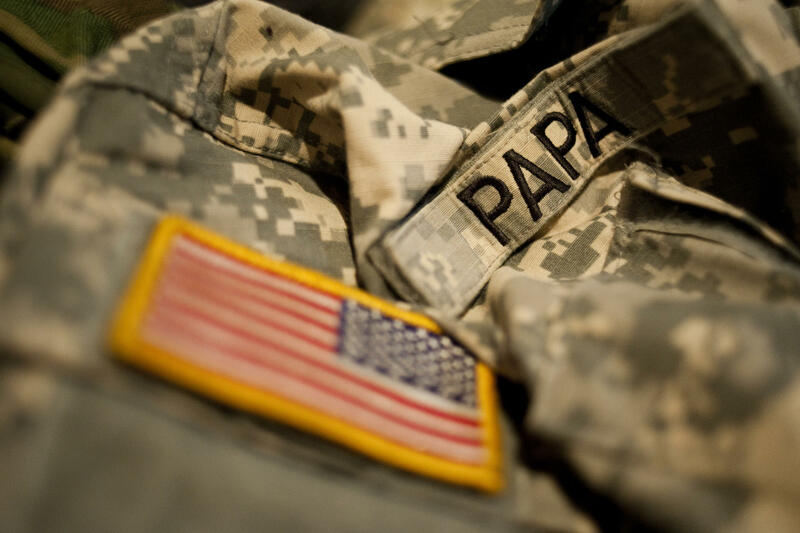 Papa was in the Army National Guard and served two tours in the Middle East in 2008 and 2009. Kyle Dewitt was sentenced to three days in jail after he was unable to pay fees associated with catching a fish out of season. Stephen Papa was sentenced to 22 days in jail, not because of his original offense, but because he couldn't pay the court fines and fees. Debtors prisons were outlawed in the United States nearly 200 years ago. And more than 30 years ago, the U.S. Supreme Court made it clear: Judges cannot send people to jail just because they are too poor to pay their court fines. That decision came in a 1983 case called Bearden v. Georgia, which held that a judge must first consider whether the defendant has the ability to pay but "willfully" refuses. However, the Supreme Court didn't tell courts how to determine what it means to "willfully" not pay. So it's left to judges to make the sometimes difficult calculations. An NPR news investigation has found there are wide discrepancies in how judges make those decisions. And every day, people go to jail because they failed to pay their court debts. In Benton County, Wash., for example, jail records obtained by NPR and sampled over a four-month period in 2013 show that on a typical day, a quarter of the people who were in jail for misdemeanor offenses were there because they had failed to pay their court fines and fees. Judges say it's difficult to determine who can and cannot afford to pay their fines and fees. Often a probation officer or a court official will make a recommendation based on an interview with the defendant or based on a questionnaire. Some judges will tell an offender to give up their phone service, or quit smoking cigarettes — and use the money instead to pay court debt. Some judges will tell people to get the money from family members or to use Temporary Aid to Needy Family checks, Social Security disability income, veterans' benefits or other welfare checks to pay their court fees first — or else face going to jail. And some defendants simply ignore the court and refuse to make any payment. Judge Robert Swisher, a Superior Court judge in Benton County, says he'll make judgments based on how people present themselves in court. "They come in wearing expensive jackets," he says referring to defendants who wear NFL football team jackets, "or maybe a thousand dollars' worth of tattoos on their arms. And they say, 'I'm just living on handouts.' "
If the jacket or tattoos were a gift, he tells the defendants they should have asked the giver for the cash to pay their court fees instead. Attorneys who defend poor clients say the Supreme Court's Bearden decision requires courts to more formally consider a defendant's ability to pay. But they say it almost never happens. Defendants don't know their right to ask for a hearing and, for judges, those could clog up the court schedule. "It's not that it's wrong to charge people money as a way to punish them," says Miriam Aukerman, an attorney with the American Civil Liberties Union of Michigan. "But there have to be alternatives for people who can't pay. And that alternative cannot be: incarceration if you're poor, payment if you're rich." She faults judges for not doing enough to find alternatives to fees for impoverished defendants, such as assigning more community service or even waiving some fines and fees. NPR surveyed laws in 50 states and the District of Columbia and found that defendants get charged for a long list of government services that were once free — including ones that are constitutionally required. In at least 41 states, inmates can be charged room and board for jail and prison stays; in at least 44 states, offenders can get billed for their own probation and parole supervision; and in 49 states, there's a fee for the electronic bracelet that monitors people when they're out of jail. The survey also found, with the help of the Brennan Center for Justice at New York University School of Law, that in least 43 states, defendants can be billed for a public defender. Those fees often add up to hundreds or even thousands of dollars. When people struggle to pay those fees, they have violated probation and can go to jail. The practice is called "pay or stay" — pay the fine or stay in jail. Recent cases like what happened to Stephen Papa and Kyle Dewitt, however, illustrate how the Supreme Court's decision in Bearden may not be as effective as the high court's intentions. Papa admits he was wrong that day last August in Grand Rapids, Mich., when he and some friends spent the day drinking, and then climbed to the roof of an abandoned building. They were arrested, and Papa was later sentenced to 22 days in jail — not for what he did that day, but because he couldn't pay his fines. Papa was a homeless veteran of the Iraq War, who was living on friends' couches. When he appeared in court the month after his arrest, the judge expected him to pay an installment on the $2,600 he owed in restitution, fines and court fees. The judge wanted $50, but Papa had only brought $25 to court that day. Papa says he tried to raise the money by doing chores. He was able to build a shed for a friend's grandparents. But the judge in Grand Rapids District Court said he could have tried harder, and made money by collecting cans or cutting grass. Before Papa walked into court that morning, things were starting to get better for him. Just the week before, he had found a good-paying job making $12 an hour at a small steel factory. 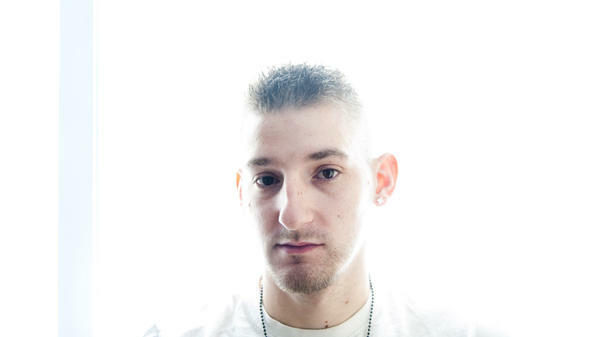 "I tried telling the judge, throwing me in jail is going to do you no good," Papa told NPR from the Kent County Jail. "You're not going to get your fines like you want. And I'm going to lose my job, and you're really not going to get your fines if I don't have a job. ... It just baffled me." But that's what happened. Papa lost his new job. He went to jail for three weeks, and when he came out someone else had filled it. Today he's working as a security guard — but gets paid $4 an hour less than he was making at the steel plant. Dewitt, also from Michigan, went to jail after he failed to pay his fines from catching a fish out of season. Dewitt's problems began when, on a Michigan river in 2011, he thought he had caught a rock bass. But a Department of Natural Resources agent said it was a smallmouth bass, which was out of season. At the time, Dewitt was 19 and the father of a baby boy. He had dropped out of school and lost his job bagging groceries. He says he tried to find the money to pay what he owed the court by knocking on neighbors' doors, offering to mow lawns or do chores. But he couldn't come up with the $155 he owed. When he didn't pay, a warrant was issued for his arrest. He says there was confusion. Court officials said paperwork was mailed to Dewitt with instructions for paying off the fine in installments. But Dewitt — who as a teen moved from his grandparents' house to his mother's, to friends' houses — said he never received the letter. He was taken to jail for nonpayment. A family member was able to pay the bail bondsman. And because that payment was for $175 — more than his original ticket — Dewitt thought the ticket was paid. So when he was summoned to court a few days later, the audio tape of his appearance before District Court Judge Raymond Voet makes it clear Dewitt was confident that the issue was behind him. But as court officials explained that day, the $175 was simply the fee for the bail bondsman. None of it applied to his original fine, which had grown to more than $200. Dewitt had come with no money, but Voet demanded payment that day. The judge then sentenced Dewitt to three days in jail. Voet says the court system can't work effectively if defendants are casual about things like paying court fees. There has to be respect for the law, he says, even on a minor violation. "If I've got someone standing in front of me for something that's labeled a misdemeanor and they've failed to follow through with court orders on that," Voet says, "am I supposed to tell the rest of the world, the rest of the law-abiding citizens, that they're chumps and fools for having respected the law and respected the court's orders?" Voet is known for holding everyone to the same rules. Last year, his own cellphone went off in the middle of an attorney's closing argument. The judge held himself in contempt and fined himself $25, saying those are the rules. Still others say the rules on fees are unfair because the costs mostly hurt the poor. "Every day poor people go to jail because they're poor," says Aukerman, who took up Dewitt's case. "Debtors prisons are alive and well in Michigan and across the country. People go to jail because they're poor. And that's a two-tiered and unequal system of justice." One person who is not surprised that people are still going to jail for being unable to afford their fines is Danny Bearden, whose case led to the Supreme Court decision. He was a young man when he was charged with breaking into a trailer. He was charged $750 in fines and restitution, but then he lost his factory job and couldn't find other work. He knocked on neighbors' doors, asking to mow lawns. When he couldn't pay the rest of his fines, he was sent to jail. His case was assigned to a court-appointed attorney, Jim Lohr, who was just a few years out of law school. It was a routine, seemingly insignificant case, but Lohr spent long hours doing research in the county law library. "It was a long shot, and I guess I just didn't know any better to ignore that," says Lohr, who now practices in Michigan. "So I went ahead with it." Yet the issue at the heart of it — whether someone can go to jail for failure to pay fines and fees — bothered judges and reached the U.S. Supreme Court. Lohr flew to Washington, D.C., to argue it. The high court, in May 1983, ruled saying judges need to distinguish between who is too poor to pay, and who can but simply refuses. Thirty-one years after his Supreme Court victory, Bearden is a supervisor at a small textile plant in rural Georgia. He sees people — his co-workers, his neighbors, his friends — get charged for things like driving offenses. Only now, he says, fines and fees add up to thousands of dollars. "These are poor people, OK? They got families and everything like that," he says. "They work a job. And even when they get behind in trying to pay, they go to jail." Let's return to our story about what some are calling modern day debtor's prison. Yesterday, we told you how people around the country are sitting in jail because they can't pay court fines and fees, even though the Supreme Court outlawed that practice three decades ago. Today, NPR's Joseph Shapiro continues our series, Guilty And Charged, with a visit to Michigan. 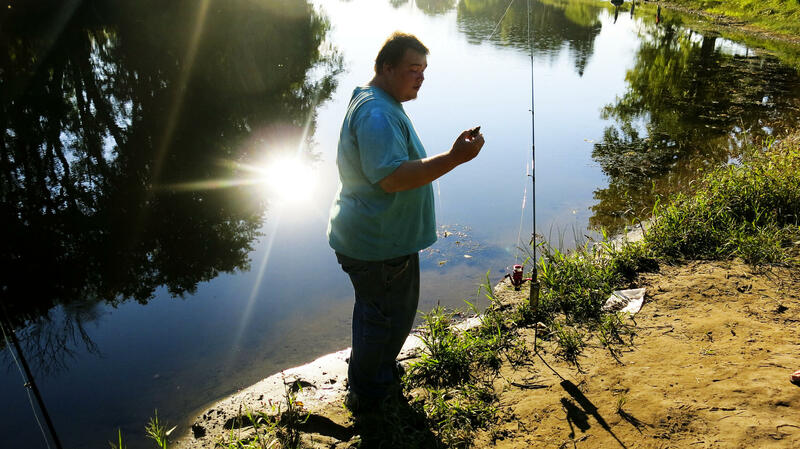 JOSEPH SHAPIRO, BYLINE: This is the story of a young man who caught a fish out of season. He says he couldn't pay the fine so he went to jail. I found Kyle Dewitt here. KYLE DEWITT: This is where I like to come when I got a lot of things on my mind. SHAPIRO: On a quiet stretch of the Grand River in Ionia, Michigan, catching fish. DEWITT: Catfish, bass, rock bass, salmon, trout, bluegill, pike, walleye. SHAPIRO: It was a bass that got Dewitt into trouble. He thought he'd caught a rock bass, which was in season, but the Department of Natural Resources agent said it was a smallmouth bass, which was out of season. Dewitt got a ticket. The fine, plus fees, added up to $155. Dewitt was 19. He was the father of a baby boy. He dropped out of high school. He was unemployed. He says he tried to find the money to pay. He knocked on neighbors' doors, offering to mow lawns or do chores, but he didn't come up with the $155. UNIDENTIFIED MAN: Dewitt. This is C607947M. State of Michigan versus Kyle Dewitt. Are you Mr. Dewitt? SHAPIRO: Which is how he wound up in Ionia County District Court in August of 2011 in front of a judge. UNIDENTIFIED MAN: If you pay it all, there's no need to put you in jail. Otherwise, we're kind of at that point. You saw what I've done with the other fellow. I'd just as soon get paid. It costs taxpayers money to put you in jail, but if that's how it ends up, that's how it ends up. SHAPIRO: There'd been confusion. Court officials said paperwork was mailed to Dewitt with instructions for paying off the fine in installments. But Dewitt, who as a teen moved from house to house, from his grandparents to his mother's to friends' houses, said he never got the letter. Now, two months after he caught that fish out of season, the fine had grown to more than $200. DEWITT: I have a quick question for you guys. DEWITT: I can bring 100 and pay on it tomorrow. I can bring 100 in once you guys open up, if that would be fine. UNIDENTIFIED MAN: Well, it needs to be paid all or you need to do jail instead. Do you have a credit card? UNIDENTIFIED MAN: You don't have any friends? DEWITT: No, sir. My family don't even help me. SHAPIRO: The judge in Ionia, Michigan, District Court Judge Raymond Voet, said he needs to make sure there's respect for the law, even on a minor violation. RAYMOND VOET: If I got someone standing in front of me for something that's labeled a misdemeanor and they've failed to follow through with court orders on that, am I supposed to tell the rest of the world, the rest of the law abiding citizens that they're chumps and fools for having respected the law and respected the court's orders? I'm not going to do that. I'm not going to make fools or chumps out of people who follow the law and comply with court orders. SHAPIRO: The judge has a reputation for holding everyone to the same rules. Last year, Voet's own cell phone went off in the middle of an attorney's closing argument. The judge held himself in contempt and fined himself $25, saying those were the rules. Still, others say the rules on fines and fees are unfair because they mostly hurt the poor. MIRIAM AUKERMAN: Every day poor people go to jail because they're poor. SHAPIRO: Miriam Aukerman, an attorney with the ACLU of Michigan, took up Kyle Dewitt's case. AUKERMAN: We live in a society in which debtors prisons, and those were supposed to have ended in the 18th century, debtors prisons are alive and well in Michigan and across the country. People go to jail because they're poor. And that's a two-tiered and unequal system of justice. SHAPIRO: NPR looked at laws in every state and found more and more fees being imposed on defendants who come through the court system. The fees are used to fund the courts or other state programs. A person can owe hundreds or even thousands of dollars. People with money pay them off, but when poor people struggle to pay, there are late fees and more fees. We found hundreds of cases in Michigan and other states where people like Kyle Dewitt even go to jail. Not for the original minor offense, but for not paying those fees that keep piling up. The U.S. Supreme Court has ruled defendants can be sent to jail but only if they willfully refuse to pay a fine they could afford. Ron Schafer, who prosecuted Dewitt, says judges will put defendants on payment plans they can afford. Trouble comes if they don't pay. RON SCHAFER: Are these folks really too poor to pay or is it a matter of priorities? Are they unable to work and therefore unable to pay or simply don't want to work? KIM NASH: My babies, I miss you so much. Mommy couldn't wait to see you. I had to wake you up. I love you, baby. SHAPIRO: It's just after sunrise and Kim Nash has come home after 11 days in jail. Only Nash, who's 23, didn't want her daughters, who are two and three, to know she was in jail. She told them she was at the doctor's. But it's hard to keep secrets from kids, and her three-year-old is smiling a mischievous smile. UNIDENTIFIED CHILD: Zoe is saying you were in jail. NASH: (Unintelligible) that I was at jail? SHAPIRO: When Kim Nash got stopped for driving without a license in Ionia, Michigan, she ended up owing nearly $1,400 in fines and fees. When the judge offered to put her on a payment plan of $25 to $40 a month, she agreed. But she never made any payments. Nash says that's because she was diagnosed with a serious illness. She left a job making auto parts. She says she couldn't work all day. She was in pain and she kept needing to take off for doctor's appointments. The prosecutor says she never contacted the court to explain. Nash was already barely getting by. She's got a cell phone, but she can't afford phone service so she uses the phone just as a camera. When Nash was called back to court in July, she agreed to go to jail because that would erase her $1,400 in fines and fees. NASH: Mommy was in jail, honey. You know, don't you, baby? NASH: Mommy won't ever go to jail again, though. I promise you. I only went to jail because I couldn't pay money. I didn't have money to pay and that's why I went to jail. So now all my money's paid up and I don't have to ever stay in jail again. Is that cool? NASH: You want mom to go back to jail? NASH: No. I missed you when I was there, though. Mommy thought about you every day. SHAPIRO: Kim Nash may be done with the criminal justice system, but not Kyle Dewitt, who caught that fish out of season. About a year after he got out of jail, a letter arrived in the mail. It was a bill for room and board for each day he was in jail. It seemed like a lot of money to him. DEWITT: I'd rather eat at Red Lobster for the $85 than what they made me eat in there. SHAPIRO: NPR's survey of fees found that at least 41 states allow jails and prisons to charge room and board. It was another fee Dewitt says he couldn't afford and it was turned over to a collection agency. To Dewitt, the whole thing makes no sense. DEWITT: It was ridiculous 'cause it was over a fish. SHAPIRO: Some judges and politicians are starting to raise questions. The Ohio Supreme Court in February told judges to stop sending people to jail for not paying court costs, and Colorado just this month made it law to stop jailing people too poor to pay their fines and fees. Joseph Shapiro, NPR News. MONTAGNE: And you can see all of the key findings of our series, Guilty and Charged, at NPR.org. Transcript provided by NPR, Copyright NPR. 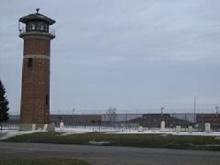 The Michigan Department of Corrections has fined Aramark, the company that handles food operations in state prisons. The MDOC notified Aramark of the fines, totaling almost $100,000, by two letters sent in the last two weeks. The MDOC said Aramark violated its contract by substituting meals, and by failing to prepare the right number of meals. The fines have been assessed for 52 unauthorized meal substitutions and 240 instances of improper meal counts. Life without parole used to be the automatic sentence for juveniles who were tried as adults and convicted of first-degree murder. That was until June of 2012, when the U.S. Supreme Court ruled that automatic life without parole for juveniles was unconstitutional. But a question here in Michigan remains – what happens to more than 350 juvenile lifers here who were sent to prison before the decision? Thursday the state Supreme Court hears arguments on that question.